Bullard, Steven (translator). 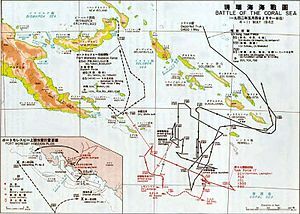 Japanese army operations in the South Pacific Area New Britain and Papua campaigns, 1942–43. Canberra: Australian War Memorial. 2007. ISBN 978-0-9751904-8-7. Japanese Demobilization Bureaux. Japanese Operations in the Southwest Pacific Area. Volume II Part I. Reports of General MacArthur. United States Army. 1966. Morison, Samuel Eliot. Coral Sea, Midway and Submarine Actions, May 1942-August 1942, vol. 4 of History of United States Naval Operations in World War II. Champaign, Illinois, USA: University of Illinois Press. 2001 . ISBN 0-252-06995-1. Rottman, Gordon. Japanese Army in World War II. Conquest of the Pacific 1941–42. Battle Orders. Duncan Anderson (consultant editor). Oxford: Osprey. 2005. ISBN 1-84176-789-1. This page is based on the Wikipedia article MO作戰; it is used under the Creative Commons Attribution-ShareAlike 3.0 Unported License (CC-BY-SA). You may redistribute it, verbatim or modified, providing that you comply with the terms of the CC-BY-SA.